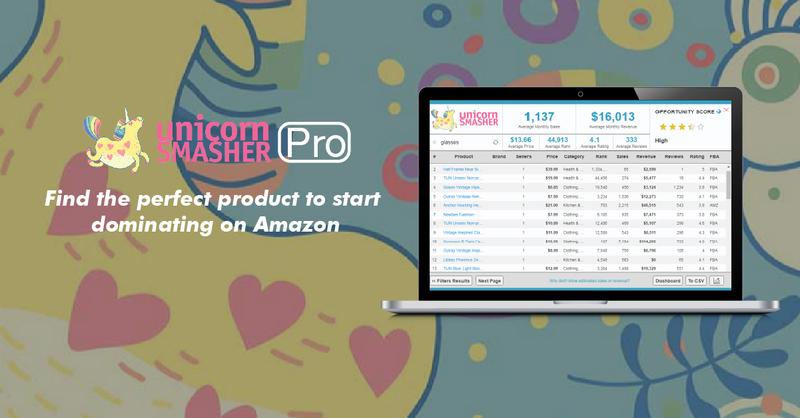 We have been working away here at Unicorn Smasher to bring you new features, and we are proud to say that day is finally here, introducing Unicorn Smasher Pro!! Here are our brand new features to help you gain an edge over the competition and boost your Amazon sales. – More accurately evaluate an item’s sales, demand, and competition with ease. Our new algorithms work hard to provide you with accurate up-to-date information making sure your selected niche and products are the best they can be. – Quickly compare demand and competition in your selected niche with our new ‘Opportunity Score’. Find the perfect gap in the market and reduce product testing time and spending. – Unicorn Smasher now features a cleaner UI with essential metrics and information listed clearly at the top of your page. Access relevant information faster and save yourself time. We hope you will enjoy these new features just as much as we enjoyed making them for you. Currently Unicorn Smasher Pro is only available in the United States; however, we plan on rolling out international versions very soon. Register now for a one-time payment of only $49 to gain access to these fantastic new features.